Starting on your dance journey is an exciting time however trying to navigate which program or which class to enroll in can be daunting. We are always here to help with your decision or to provide information. Dance, just like school is based on a 9 months of dance education. It is an exciting time with great classes and an opportunity to be in a fabulous show at the end of the dance program. 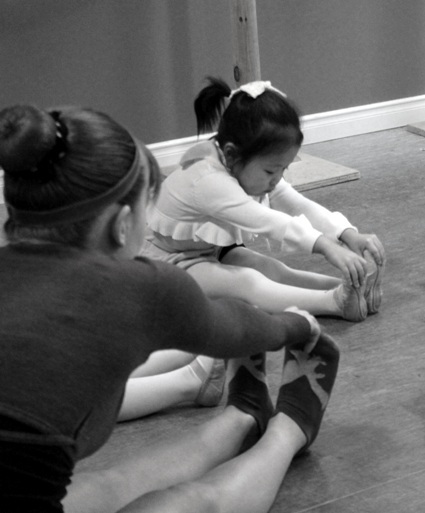 The Studio offers over 80 classes/week so we know we have the perfect fit for each dancer. In order to make it all easier for our dance families, we divide the year into 2 terms: Fall and Winter. Doing your registration: On-line, over the phone, in person at The Studio. At registration payment for the full year may be made, or payment for 1st term only with a postdated cheque or credit card for 2nd term on file. (Monthly payment arrangements are available) and we are happy to provide an interest free payment plan. If you are doing your registration on-line and would like a payment plan or to pay for the full year, please indicate this in the comment box. There is a registration fee of $25.00/student for each year. All set for class, The Studio is a very friendly, nurturing environment and on your 1st day we work to make it amazing. There are no refunds once classes have begun with the exception of KinderSteps where there is more flexibility due to the young age of the dancers. Almost every class requires a costume for the year end recital, the fee for the costumes is posted in January or February. We also love to give our families opportunities to SAVE on Dance Classes, Summer Dance and Summer Day Camps. 10% SAVINGS ON FALL & WINTER DANCE CLASSES BETWEEN MAY 1 – 31ST. Recital handbook available after April 1. This is an exciting time for the dancers. They begin choreography for the year end show in February of each year, costumes are ordered, rehearsal is held, tickets are sold for the big event… The dancers are excited to show their family and friends what they have learned throughout the year… information on our year end show will be on the website as well as posted on our studio dance boards and e-mailed to families. The A.D.A.P.T. syllabus is an organized method of teaching. It is the best performance based syllabus in Canada. Our teachers are all experienced in the ADAPT method. Exams take place in November or December. The Society of Russian Ballet syllabus is dynamic and performance-based. Exams also take place in November or December. Recreational students are encouraged to participate in exams and the teachers will invite dancers once they are ready for each level. Register for a competitive audition today!